UrHappyBunnie: Deep Ended Half Truth Omen. Deep Ended Half Truth Omen. Exactly what the title says. 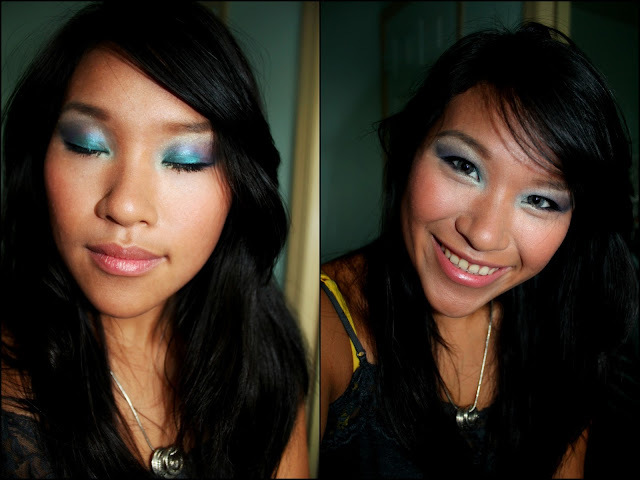 :) These are the three main shadows I used for this look that is from the Urban Decay 15th Anniversary Palette. These three shadows are my favorite among all the 15. All shadows are very soft, highly pigmented and blendable. I am in love with all the colors. I wish I could use them all at once. UD's Deep End - using a flat shader brush, pat all over the inner 2/3 of the lid, blend the harsh lines with a clean blending brush. UD's Half Truth - using a shader brush, place on the remaining part of the lid and then bring up to the crease sweeping it inwards above the Deep End. Using the tip of the brush, bring the color down to the outer third of the lower lash line. Blend any harsh line with a blending brush. UD's Omen - with a small blending brush, place the the shadow between Deep End and Half Truth creating a nice gradient between the two colors. UD's Vanilla - use as a brow bone highlight as well and also placed in the inner corner of the eye and inner portion of the lower lash line. UD's 24/7 Waterproof Liquid Eyeliner in Perversion - make a winged liner with the flick connecting to the outer portion of the lower lash line. L'Oreal Hyrdofuge Voluminous Mascara in Carbon Black -layer on top of the other mascara. Revlon Lipstick in Siren - dab on the center of the lips over the other lipstick and blend with a clean finger.